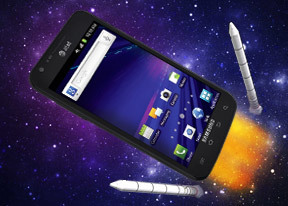 We have the Samsung Galaxy S II Skyrocket all set on the launch pad. Announced together with the HTC Vivid, the smartphone is among the first LTE enabled devices, compatible with AT&T’s all new LTE network. The smartphone is certainly a welcome addition to the U. S. Samsung Galaxy S II lineup, as LTE was the only connectivity flavor missing in the lineup so far. If you find the device looks somewhat familiar, there is a good reason for it. The Skyrocket is almost 100% identical to the T-Mobile Galaxy S II, which we came to like quite a lot. The handset has the same size and uses the same hardware, save for two major differences. First, the Skyrocket does not have NFC connectivity out of the box, even though it is capable of it. The second is much easier to notice – it is the LTE radio on board. While the Galaxy S II purists might scoff at the presence of the Qualcomm-made CPU on board (the Exynos is still the fastest dual-core silicon we have seen), we must point out that it is the reason why the smartphone is capable of working on 4G networks. As always, you will find the rest of the Skyrocket’s key features below. As you can probably notice above, the phone has more than one can possibly need in terms of sheer specs. The only major letdown we can think of is the WVGA resolution of the Skyrocket’s screen. At a time when HD screens begin to pop up with increasing frequency, we do believe that an Android flagship should be offering more than 800x480 pixels of resolution. The Super AMOLED Plus unit of the Skyrocket however, still trounces most of the competition with superior contrast and viewing angles. Traditionally, we are now going to kick things off with an unboxing and a hardware inspection of the Galaxy S II Skyrocket. Editorial: You might notice that this review is shorter than usual and doesn't include all of our proprietary tests. The reason is it has been prepared and written far away from our office and test lab. The Samsung Galaxy S II Skyrocket is a US-only phone, so it will probably never get to the shores of the Old Continent. Still, we think we've captured the essence of the phone in the same precise, informative and detailed way that's become our trademark. Enjoy the good read! Pls tell me what is the current price of this phone. Any one wants to sold this phone ? I purchased the HTC Vivid over this one, mainly for the slightly better screen resolution. By the way, the Galaxy S II Skyrocket is $249.99, and the Vivid $199.99 for the two year contract.